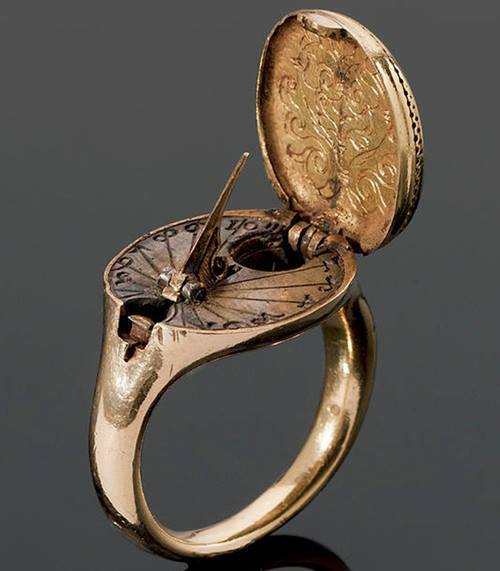 A rare 16th century gold sundial and compass ring, possibly German, circa 1570. The hinged oval bezel designed as a seal and engraved with a coat of arms, opening to reveal a sundial and compass, on a plain gold hoop. . . . If you have a piece of art, exhibition, or event you would like featured in this blog, send me an email with the details. I'm very interested in helping artists and historical institutions attract visitors to their cultural work!